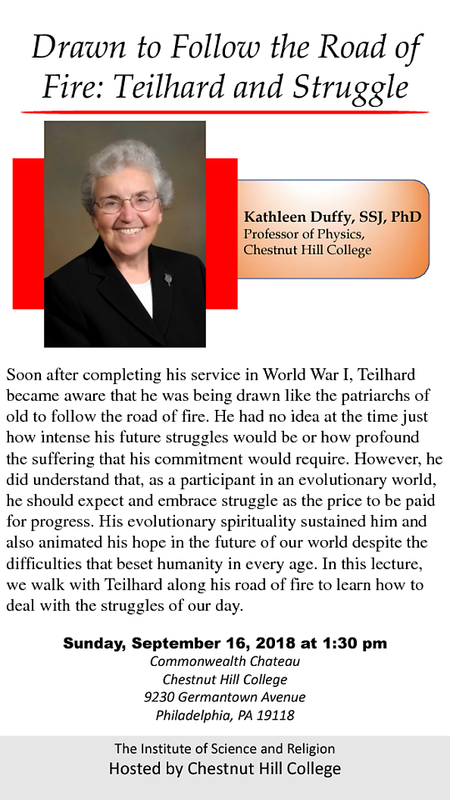 Kathleen Duffy, SSJ is Professor of Physics at Chestnut Hill College, where she directs the Interdisciplinary Honors Program and the Institute for Religion and Science. She is editor of Teilhard Studies and serves on the Advisory Boards of the American Teilhard Association and Cosmos and Creation. Her present research deals with the way Teilhard de Chardin’s religious writings connect with modern science. She has published several book chapters and articles on these topics, an edited volume of essays entitled Rediscovering Teilhard’s Fire (St. Joseph’s University Press, 2010), and Teilhard’s Mysticism: Seeing the Inner Face of Evolution (Orbis Books, 2014). Come join us at 1pm on September 16th! Free Will Donations are accepted and very much appreciated. Light refreshments will be offered.